Objectives: Many women experience unplanned pregnancies in their life and have to make a critical decision whether to abort or continue with the pregnancy. The present study aimed to assess the factors affecting the decision about unplanned pregnancies. 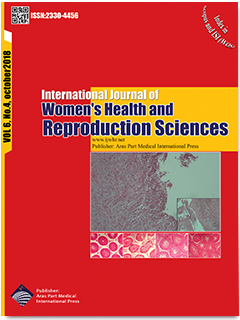 Materials and Methods: The present prospective study was conducted on 230 women with unplanned pregnancy who were selected through sequential sampling, including 80 women who had decided to abort and 150 who had decided to continue with their unplanned pregnancy, and referred to health complexes and centers, and obstetrics and midwifery offices in Tabriz, Iran, in 2017. Data were collected through perceived threats, support, and beliefs and values questionnaires and analyzed using the t-test and the logistic regression with a hierarchical modeling strategy. Results: According to the results, the mean scores of perceived threats (40.02±5.5), perceived support (23.09±2.8), and beliefs and values (18.12±3.2) were significantly higher in the abortion group compared to the continuation group (19±3.3, 21.04±3.05 and 11.2±4.3; P < 0.001). The results of the hierarchical modeling strategy showed that the perceived threats of the continuation of pregnancy had the greatest predictive power over the decision to abort (β=1.12; 95% CI: 1.08-1.17; P < 0.001). Conclusions: The results of this study showed that women’s decision about the outcome of unplanned pregnancy is potentially affected by three groups of reasons, including perceived threats, support, and beliefs and values. Indeed, understanding these factors provides a broad picture of the situations affecting women’s decision-making. The findings of this study suggest the need for planning and implementing counseling interventions based on the abovementioned factors, especially identifying perceived threats and providing appropriate strategies to remove these threats in women who have to make such critical decision in their life.